It’s a busy week this week at TableCrowd, which is great news for our last minute diners as there are plenty of tables to book on before it’s too late. For startups in pre-seed and seed stage, our Seedcamp dinner tonight is a must. Freelancers should join our networking dinner with Greg Dillon and meet other freelancers tomorrow evening. As part of International Women’s Day we have our dinner celebrating women social entrepreneurs also on Tuesday night. And finally, you’ll find some of the TableCrowd team joining Ivan Retzignac, from MedicAnimal.com, at our e-commerce dinner on Wednesday. Because, who wouldn’t want to hear from the CEO of the largest and fastest-growing e-commerce businesses in Europe? Are you keen to tell the story of your startup, but not sure how to go about it? Julian Blake, editor of TechCityinsider will be talking our diners through how they can promote their startup business through the media, whether it’s for attracting coverage or to assist the general progression of a company. Dinner is at 6:45pm on Tuesday 17 March at Rocket, Holborn. 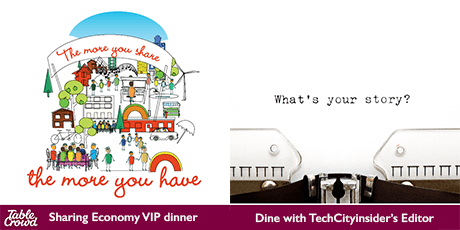 On behalf of Compare & Share and Jumio, credentials management specialists, we have the immense pleasure of organising an exclusive, invite only VIP Sharing Economy evening of great food and stimulating conversation. Benita Matofska, Chief Sharer at Compare & Share and winner of numerous awards including 2013’s Ogunte Women’s Social Leadership Awards for Best Social Business Leader UK & Worldwide and Natwest Venus Business Award for Inspirational Woman, will be speaking at the event. We have also just announced an upcoming dinner for the Fitness Industry, this is a new series of dinners hosted by BeInspired Fitness. The first dinner takes place on Monday 13 April. Feel free to take a look through all of our dinners here.